The puppets used for the Rubovian Legends plays were marionettes, operated using a 45-degree control of Gordon Murray's own design. Thin nylon strings about eight feet long were attached to the puppets’ legs, hands, head, shoulders, back. The two-foot tall puppet characters were constructed of foam latex rubber, plastic, wood, glue, wire, lead and various textiles. When not in use, they were hung in a long storage room, accommodating 300 puppets. In a recently rediscovered letter dated 30th October, 1979, Gordon Murray wrote the following answers to several questions about his marionette puppets used in the Rubovian Legends and his other BBC Puppet Theatre productions. Since the original questions have been long forgotten, we have created new ones to provide some sort of context to Gordon's answers. Q: I would guess that the puppets would have seriously deteriorated after so much time has passed? Q: I understand that you developed your own marionette controls? GM: I devised a sort of 45 degree control. 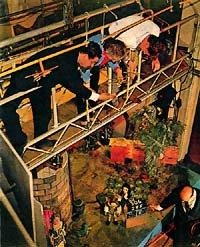 As the puppeteers worked from a rather high bridge, it was necessary to have an arrangement inside the puppets' heads to ensure a positive sideways movement. Apart from this, the controls were very simple. The mouth strings were operated by a sort of "twanging" movement of the third finger. Q: When did you first become interested in puppetry? GM: I have been interested in puppets ever since I was a child. My enthusiasm was greatly stimulated, I remember, by a visit to the Victoria Palace when I was about eight to see Delvain's Marionettes on the variety bill. Later, of course, I avidly read the Wanslaw books. "So now we use particularly sympathetic members of the human race, known as puppeteers, to animate the figures. Only they can understand the stresses and strains experienced by a puppet when playing a large and demanding part. Only they can fully appreciate the fact that their actor has crossed from the door to the table without tripping on the carpet or fluffing his lip movement. Only they can experience the feeling of supreme achievement when a puppet teapot successfully pours out a puppet cup of tea--even if it is the tenth take. "So next time you happen to see the King of Rubovia playing chess, or Mr. Weatherspoon operating a particularly complicated machine of his own invention, please spare a thought for the puppeteers. Perched high above on the bridge, with only a bird's-eye view of their charges, they are particularly vulnerable to the heat of the lamps and the nattering of an over-demanding producer." (click for larger image 105K) This is a scene from Bees and Bellows in the Puppet Theatre studio in the BBC's then new Television Centre, in 1962. Here we see Bob Bura (L), Audrey Atterbury, and John Hardwick(R) on the bridge, ready for action, waiting for the soundtrack dialogue to begin after Gordon Murray moves the clapper board out of the view of the camera. Points of Interest: If you look carefully you'll see that the puppet controls are very similar to the control in Gordon Murray's sketch shown above. 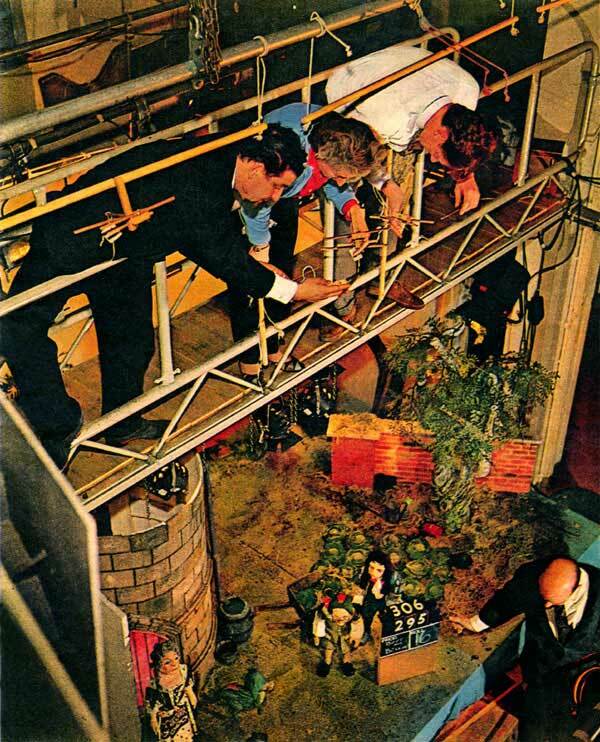 Another photograph taken from a different angle shows that the queen is actually not appearing in this scene, but is instead hanging from her control, out of view of the film camera, two feet up above the stage! This is more obvious in the next photograph, below. Notice that her control is hanging on a hook, higher up than the controls in the puppeteers' hands. Note the full use of colour on the set, even though the filming was all done in B&W. The puppet bridge is of sturdy welded tubular steel construction. 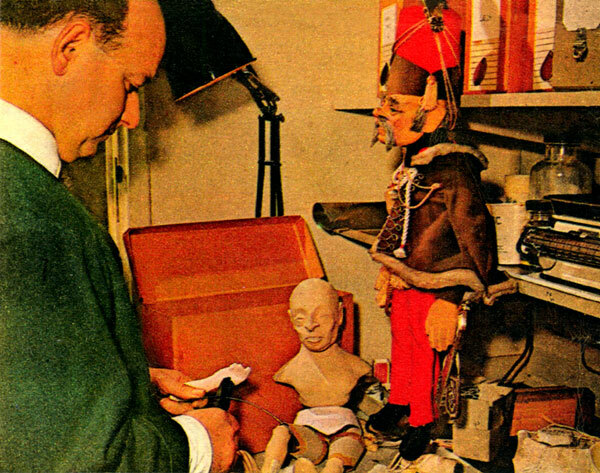 This picture originally appeared in the article, The Tiny World of Puppets, Look and Learn magazine #38, 6th October 1962. Photograph by Rosemary Mathews. Look and Learn was published by Fleetway Publications Ltd.
(click for larger image 114K) Two more views of the above scene, taken a short time later. These pictures appeared in the article, A Peep at Rubovia, Girl comic, 17th March, 1962. (click for larger image 114K) Gordon Murray making one of his puppets, BBC Television Centre, 1962. He is trimming the wire used to joint the puppet's arm to its body. The Rubovia puppets were all made by Gordon, first sculpted in modeling clay, from which plaster moulds were made. The moulds were then used to cast foam latex rubber. The limbs were joined onto the puppet’s body with wire. The completed puppet bodies were then turned over to designer Andrew Brownfoot, who painted the faces, created the costumes, and dressed the puppets. 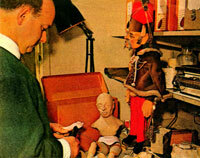 The typical working life of each puppet was about two years. 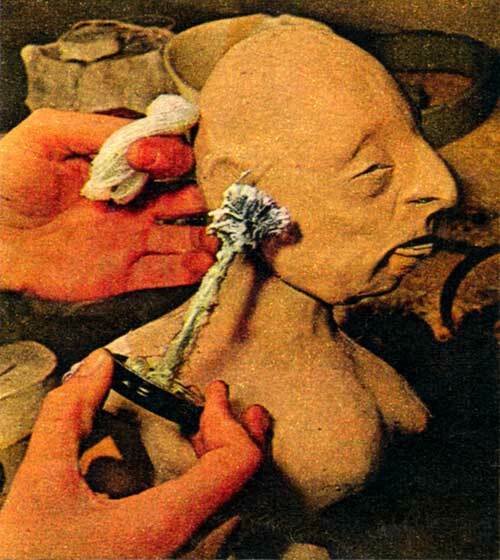 (click for larger image 49K) Hair being glued onto a puppet’s head. Each puppet was about two feet high (1/3 life-size) and weighed between six and eight pounds. (click for larger image 62K) Two of Gordon Murray's puppets hanging in the storeroom, waiting to appear before the camera. Although these are not Rubovia puppets, the Rubovia puppets were quite similar to these in finish and appearance. 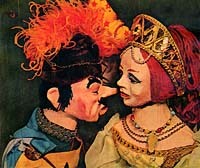 The male puppet was used in Gordon Murray's puppet play, The Dancing Princess, BBC Productions, 1962.